This is one of my favorite posts at this time of year. Here is your quick refresher course before the relatives arrive this week ......No one has ever had the crystal police show up and give tickets for using the wrong glass, but you do need some basics to pull it off with a flair. 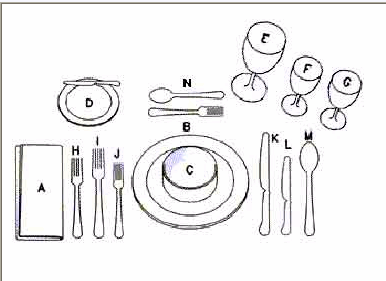 Below is an example of a formal setting, which can be used as a starting point. You can add or subtract depending on your menu, how formal or casual you would like to make the meal. I prefer more casual dining so I love to mix and match and shake things up a bit. Having everything match is not required, it makes for an interesting table. We never use bread and butter plates, and don't own any. The fish forks and knives shown below are not necessary, but fun to use if you do own and of course that you will be serving fish. You only have a few days.....the in-laws need to be assured that you know your stuff. 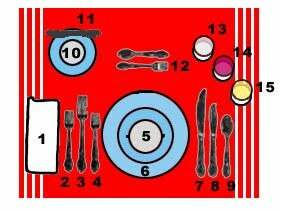 Last but not least, serve from the left and clear from the right and do not stack the plates! I love the "Cheese burger in paradise" photograph.